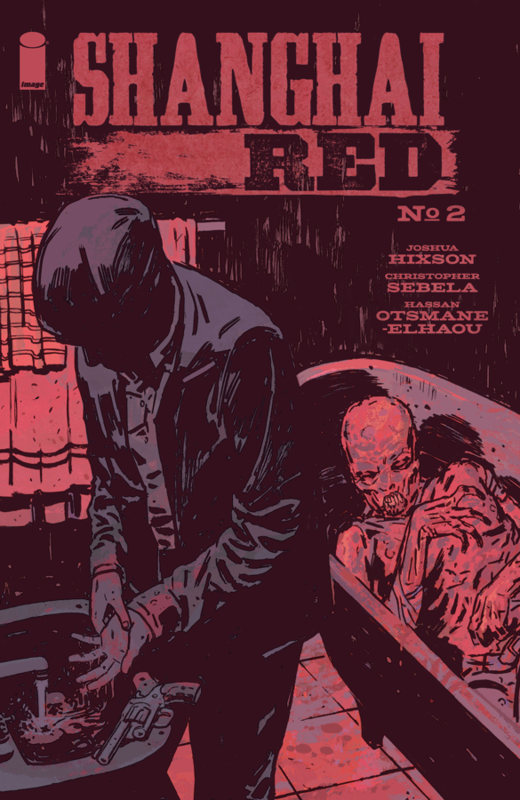 Shanghai Red #2 review: A sad tale of revenge that hits the right buttons – AiPT! The second issue increases the intensity of the the first issue. The first issue of Shanghai Red was a gripping debut that introduced readers to its titular character and effectively explained her motivations. Unlike many first issues that set up stories with little action, Shanghai Red never seemed to slow down even while explaining its backstory. The second issue increases the intensity of the themes explored. The debut issue made it clear that Red/Molly has a deep bond with her family. Her thirst for revenge is just as much about avenging them as it is about exacting retribution for herself. The psychological toll taken on the woman once nicknamed “The Queen of the Wolves” is painfully obvious. Her reasons for vengeance are easy to understand, but it is also sad to see Red wander around Portland as she loses touch with the real world. Red’s tenuous relationship with reality becomes more dubious when she learns what has become of her sister, Katie. Over the course of three powerful pages, the reader sees Red lose her composure for the first time. It is a shocking change of pace and is an appreciated addition to a character that threatens to become one dimensional. Christopher Sebela’s writing is top-notch as he succeeds in making the sometimes over-the-top Red relatable. The violence in the issue also escalates as Red callously hunts down the men who kidnapped her. The scenes are brutal and do a great job of illustrating the level of retribution that she is seeking. One particularly grim scene in which Red goes over the healing properties of sugar in rum is darkly comedic while also demonstrating her cold-hearted resolve. The fights successfully advance the plot while also delving further into Red’s psyche. Joshua Hixson’s art prevents the brutality from ever seeming excessive. The art is incredibly detailed and some panels bring the reader right into the action. Fear, anger, pain, and shock jump off the page and it is sometimes hard to not feel bad for the men Red is killing. Hixson deserves the highest praise for being able to almost elicit pity for man who will kidnap and sell a woman into slavery for a few bucks. It’s not just in Shanghai Red’s cruelest moments that emotion is competently drawn, however — Red is seen during moments of carefree happiness and in states of dismay. Hixson is also able to covey determination and greed and does a great job of developing characters with just pictures. The coloring continues to be breathtaking. Hixson does a great job of using shadows along with dark blues to provide a tense atmosphere. The fight scenes are liberally splashed with red, creating the effect of reader’s not just seeing the kicks and punches, but actually feeling them. Much like the previous issue, there are also scenes that use brighter colors to evoke a different set of emotions. Shanghai Red continues to be a perfect melding of writing and art. A revenge story that refuses to follow tropes, Red instead takes those tropes and uses them to its advantage. The main character is fleshed out and none of the bad guys are generic thugs. This is a comic worth reading. The art and coloring of Joshua Hixson is great and adds detail and character to the story. Christopher Sebela adds another dimension to Red seamlessly.